What if people were granted god-like powers, only to lose them to a crippling disease? What if the prophesied hero failed and an immortal emperor ruled for centuries? What if the only people who gained superpowers were evil? What if you could craft a perfect replica of the human soul? In answering these questions, revolutionary author Brandon Sanderson is heralding a new era of fantasy for the 21st century. For a fantasy writer known for penning doorstopper-length novels, this admission sounds almost blasphemous. Yet Sanderson, who has authored nearly 20 novels and hit #1 on The New York Times bestseller list last month with his latest, Words of Radiance, spent his youth avoiding books (especially ones with “shiny award stickers”). It wasn’t until an eighth grade teacher handed him a copy of a Barbara Hambly novel that he fell in love with fantasy. “After discovering [Dragonsbane], I said, ‘I have to learn how to do this. There’s something about this that is me,’” Sanderson says. Sanderson began writing his first book, “a bad knock-off combination of Dragonlance and The Dragonbone Chair,” within the next year. Embarrassed by his efforts, he hid the pages behind a painting in his bedroom so his family wouldn’t discover them. This first attempt at writing would become the only manuscript he ever abandoned before it was completed. Instead of penning six novels, Sanderson wrote 13 in eight years. He’d taken the graveyard shift as a hotel desk clerk after graduation, allowing him time to write from midnight until 6 a.m. every morning. “I actually did the starving artist thing, which is awesome to be able to tell people,” Sanderson jokes. Rejection letters for eight years of manuscripts piled up, and Sanderson’s family became nervous. “[My mom] kept having my dad call me; she was so worried about me,” he says. Then Sanderson received a life-changing voicemail. An editor wanted to buy his sixth book. 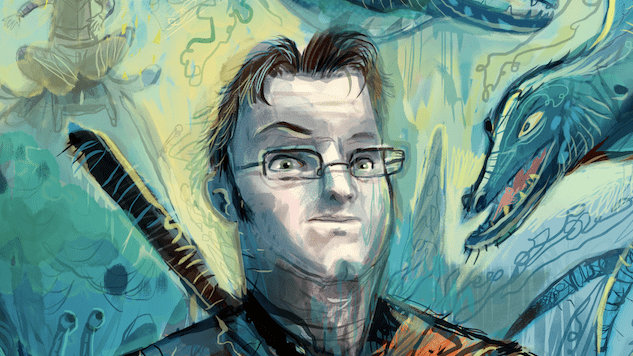 Illustration of Brandon Sanderson by Timothy Banks. Feder acquired Elantris, Sanderson’s first published novel, for Tor Books. Feder insists he hadn’t been sitting on the manuscript for quite so long (“every time Brandon talks about it, I think he makes it even longer”), but enough time had passed for Sanderson to move twice and get a new email address. He eventually tracked down Sanderson’s grad student webpage, complete with a current phone number. As magical as it was, this was only the first life-altering phone call Sanderson received. …I sit here thinking that something has CHANGED. Something is missing. Some hated you, Mr. Jordan, claiming you represented all that is terrible about popular fantasy. Others revered you as the only one who got it RIGHT. Personally, I simply feel indebted to you. You showed me what it was to have vision and scope in a fantasy series—you showed me what could be done. I still believe that without your success, many younger authors like myself would never have had a chance at publishing their dreams. So concludes Sanderson’s eulogy on his blog to Robert Jordan, the world-renowned author of The Wheel of Time series. Jordan had passed away a day earlier, ending his battle with cardiac amyloidosis that began in the spring of 2006. As the fantasy world mourned Jordan, fans also questioned the fate of his popular series. Though Jordan had written some scenes and outlined sections of the final tome in The Wheel of Time series, the book remained unwritten at the time of his death. Fans knew Harriet McDougal, Jordan’s widow and editor of the series, would pick an author to complete the last book, but her choice was anyone’s guess. Sanderson only had three novels in print, Elantris and two titles from his Mistborn trilogy, when McDougal contacted him. Though they were selling well, his titles had yet to establish him as a master of the genre. Far from screwing it up, Sanderson expanded Jordan’s plan for the final book, authoring three, #1 New York Times bestselling novels to conclude the series. Jordan fans quickly embraced Sanderson, who is committed to making convention appearances and attending book signings for The Wheel of Time for years to come. At JordanCon, where his panels overflowed with eager listeners, cosplayers dressed up as characters from both The Wheel of Time and Sanderson’s original novels, revealing how the two fandoms have grown to overlap for many readers. Robert Jordan was a great man, and was the single greatest influence on my development as a writer. What I have done these last five years has been an attempt—a sometimes flawed but always earnest attempt—to show my appreciation. This entire genre owes him an enormous debt. My debt to him, and to Harriet, is greatest of all. 1) An author’s ability to solve conflict with magic is DIRECTLY PROPORTIONAL to how well the reader understands said magic. 3) Expand what you already have before you add something new. In the years leading up to and during his time concluding The Wheel of Time series, Sanderson developed three Laws of Magics for the fantasy genre. He’s been quick to point out on his blog that the laws merely serve as “guidelines” for his own writing, but his insight is revolutionizing the traditional approach to fantasy writing. Literature has a history of ignoring rules when it comes to magic—it is magic, after all. But the 21st century is cultivating a new breed of reader who doesn’t take magic for granted. Sanderson’s laws appeal to their desire to understand how Dorothy’s ruby slippers transport her between worlds and why the Phial of Galadriel shines brighter when used by Sam vs. Frodo. From allomancy to surgebinding, the magic systems in Sanderson’s novels are both incredibly original and comprehensively detailed. Beyond his penchant for establishing unique systems of magic in multiple worlds, Sanderson has a tendency to dream astronomically. “At some point,” Sanderson says, “I was inspired by Michael Moorcock’s Multiverse and the way Isaac Asimov eventually connected his Foundation novels and robot novels, to write a ‘stealth’ series into the background of my novels.” Enter the Cosmere. An entire universe distinct from our own, the Cosmere consists of 10 (and counting) planets with autonomous magic systems, geographic characteristics and storylines. All of Sanderson’s novels (excluding his YA and The Wheel of Time titles) exist within the Cosmere, but each planet’s book(s) can be read independently of the others. In simpler terms, Sanderson has subtly connected everything—so subtly, in fact, that only one character is granted the ability to travel between worlds. Hoid, the world jumper and mysterious fan favorite, appears in every Cosmere-set novel. But don’t plan on always recognizing him; the intelligent trickster favors disguises. And, to be honest, no one besides Sanderson understands Hoid’s significance at this point. Sanderson also chose to post Warbreaker, one of his stand-alone novels, for free on his website in 2007. Many people, including his agent, thought the idea was crazy, but he stood firm. “Your time is probably more valuable than your money, so I’ll give you the money part for free if you’ll give me your time,” Sanderson explained. Six years later, Warbreaker is still available for download on the site, and Sanderson’s readership only continues to grow. Dedication to his craft, intricate world building—none of this would matter if there wasn’t a relatable, human element to Sanderson’s characters. Three-dimensional personalities permeate his novels, from Vin, a street urchin yearning for friendship yet terrified of ever needing to rely on others, to Dalinar, an aging Highprince who seeks to replace the fury of his youth with peace and scholarship.